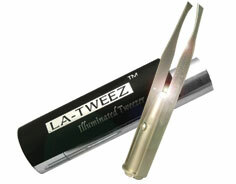 La Tweez - Tweezers with a Light! I spotted a pair of tweezers in my friends make up bag the other day and thought what a useful tool! They were called La Tweez and they were not a simple pair of tweezers but accompanied by a light, enabling you to see the hairs on your eyebrows that you cannot spot so easily. I went and bought myself a pair and they happen to be my best buy of the month! Being blonde I have a lot of fair hairs that I sometimes cannot see and find them hard to remove, as I sometimes apply eye shadow or highlighter underneath my eye brows I find that the fair hairs act as a barrier and the shadow falls off. Now that I can easily see them with the light I can just pluck them out myself, saving a trip to the beauty salon to get them waxed! These can be found on HQhair.com for £10.99.